Every time the player acts, the game responds [and] tells the player your action causes the game action: you are the cause. Every time the player acts, the game responds. When the math student acts, how does math class respond? And how is that response different in video games? Watch how a video game responds to your decision to jump off a ledge. The video game interprets your action in the world of the game. The math software evaluates your action for correctness. One results in the joy in being the cause, a fundamental feature of play according to Groos. The other results in something much less joyful. To see the difference, imagine if the game evaluated your decision instead of interpreting it. I doubt anyone would argue with the goals of making math class more joyful and playful, but those goals are more easily adapted to a poster or conference slidedeck than to the actual experience of math students and teachers. So what does a math class look like that responds whenever a student acts mathematically, that interprets rather than evaluates mathematical thought, that offers students joy in being the cause of something more than just evaluative feedback. “Have students play mathematical or reasoning games,” is certainly a fair response, but bonus points if you have recommendations that apply to core academic content. I will offer a few examples and guidelines of my own in the comments later tomorrow. 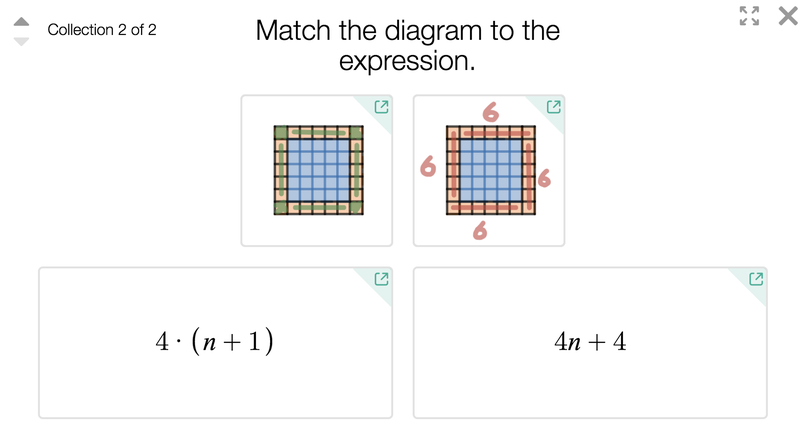 I feel like a lot of the best Desmos activities do that, because they can interpret (some of) what the learner inputs. When you do the pool border problem, it doesn’t tell you that your number of bricks is wrong – it just makes the bricks, and you can see if that is too many, too few, or just right. In general, a reaction like “Well, let’s see what happens if that were true” seems like a good place to start. My favorite example of this is when Cannon Man’s body suddenly multiplies into two or three bodies if a student draws a graph that fails the vertical line test. I am so intrigued by the word interpret. “Interpret” is about translating, right? Sometimes when we try to interpret, we (unintentionally) make assumptions based on our own experiences. Recently, I have been pushing myself to linger in observing students as they work, postponing interpretations. I have even picked up a pencil and “tried on” their strategies, particularly ones that are seemingly not getting to a correct solution. 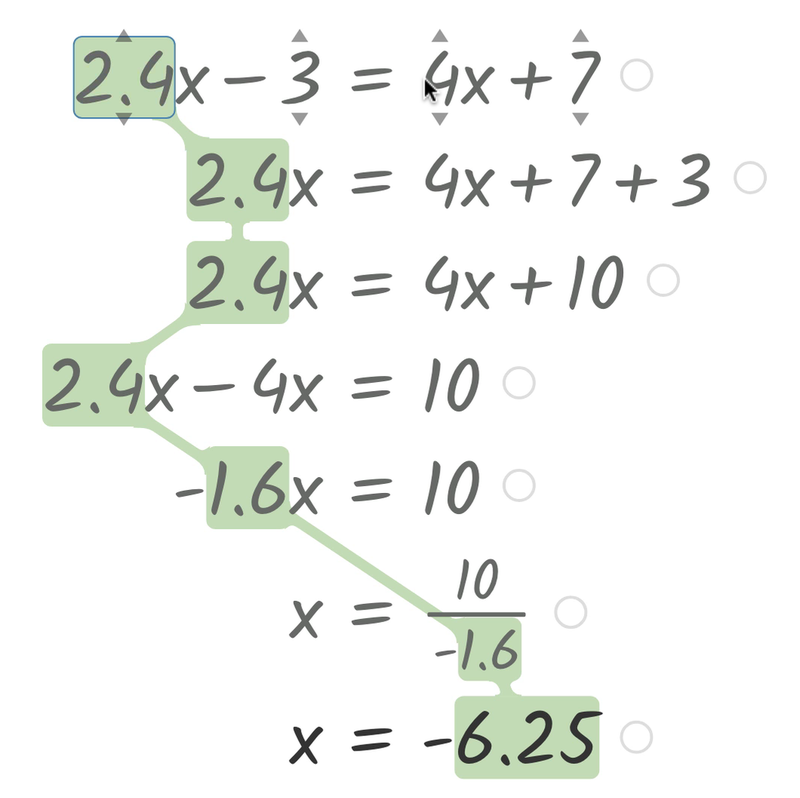 I have consistently been joyfully surprised by the math my students were playing with. I’m wondering how this idea of “trying on” student thinking fits with technology. When/how does technology help us try on more student thinking? I think that many physical games give clear [evaluative] feedback as well, insofar as you test out a strategy, and see if you win or not. Adults can ruin these for children by saying, “are you sure that’s the right move?” rather than simply beating them so they can see what happens when they make that move. The trick there is that some games you improve at simply by losing (I’d put chess in this column, even though more focused study is essential to get really good), where others require more insight to see what you actually need to change. Let me describe a powerful teaching tool we just released and the company values that compelled us to build it. We believe that math class should be social and creative – that students should create mathematics in every form and then share those creations with each other and their teachers. Many other companies disagree with those values, or at least they spend their limited time in the world acting on different ones. 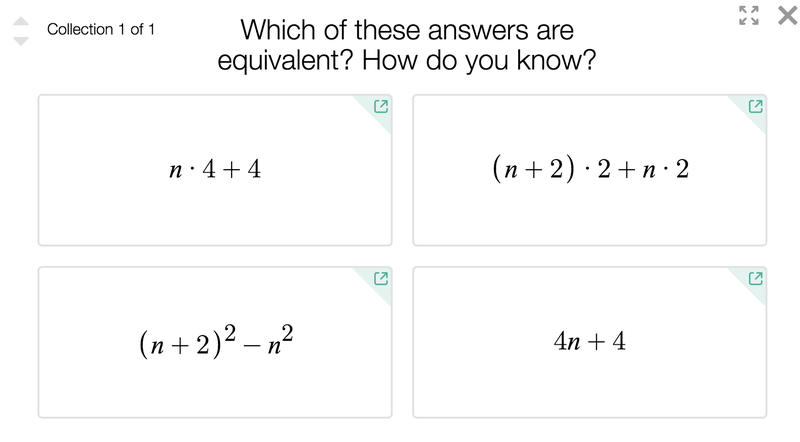 For example, many other companies think it’s sufficient for students to create multiple choice and numerical responses to express their mathematical thinking and to share those responses with a grading algorithm alone. What should teachers do with all these expressions of mathematical creativity that algorithms can’t grade? Let’s say we ask students an interesting question about mathematics or we ask them to define a relationship and sketch its graph. That’s good math, but the teacher now has dozens of written answers and sketches that their computers can’t grade. Mary Kay Stein and Margaret Smith’s Five Practices for Orchestrating Productive Mathematical Discussions. Smith and Stein describe five teaching practices that promote student learning through summary discussions. Teachers should (1) anticipate ideas students will produce during a task or activity and then (2) monitor student work during class for those ideas and others that weren’t anticipated. Then the teacher should (3) select a subset of those interesting student ideas, (4) sequence the order of their presentation, and then help students (5) connect them. In our classroom observations of our activities, we noticed teachers struggling to select student ideas because there were so many of them streaming from the students’ heads into the teacher’s dashboard. Sometimes teachers would make a note about an idea they wanted to select later, but when “later” came around, the student had already developed the idea further. So then we saw teachers take screenshots of that idea and paste them into slide software for sequencing. Smith and Stein’s recommendations are already ambitious and our software was not making it easier for teachers to enact them. If you see interesting ideas at any time during an activity, press the camera icon next to it. Then go to the “Snapshots” tab. Sequence the ideas by dragging them into a collection. Add a comment or a question to help students connect their classmates’ ideas to the main ideas of the lesson. We tested the tool ourselves during a summer school session in Berkeley, CA, and also with teachers around the country. What we’ve noticed is that students pay much more attention to discussions when the discussion isn’t about a page from the textbook or a worked example from the teacher but about ideas from the students themselves. Here are some of our other favorite uses from the last month of testing. Your decision to spend your limited class time talking about your ideas, your textbook’s ideas, or your students’ ideas is a loud expression of your values. Students hear it. We hope your students hear how much you value their mathematical creativity, explicitly in your words and implicitly in how you spend your time. You bring those values. We’ll keep working on tools to help you live them out in your classroom every day.